Man & Machine has been making waterproof keyboards for over a decade. 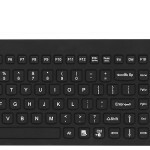 The Really Cool, our premium washable keyboard, is a medical grade keyboard that is sealed and seamless. Our typing devices are designed to be washed at the workstation and with tactile feedback in mind. If you are seeking to reduce Hospital Acquired Infections or increase hand hygiene, our waterproof keyboard line can help. Cleaning your keyboard on a regular basis can reduce employee sick time or illnesses being passed from employee to patient. Waterproof keyboards can also help if you work in a dirty or grimy environment. Our keyboards are designed to be wiped clean without needing a high pressure washer or removing keys to remove obstructing particulate. Keep your staff working without needing to swap out keyboards in the middle of a busy working day.